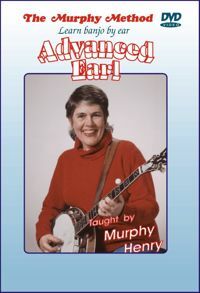 Advanced Earl: And when we say “Earl” of course we’re talking about Earl Scruggs, THE MASTER of the five-string banjo. He’s the one who gave us all the great licks you’ve been learning and many of the tunes. Every one from Bela Fleck to Cia Cherryholmes has at one time studied Earl. The five selections presented here are chock full of new advanced-level licks. “Sally Goodwin” and “Foggy Mountain Special” in particular form the bedrock for much up-the-neck playing and improvising. “Sally Goodwin” will make your fiddling friends happy, while “Foggy Mountain Special” is a boogie-woggie tour de force. These classic bluegrass tunes are not only for devoted Scruggs-style students. They are for anyone who wants to play at the higher-level jam sessions. When you trot out “Groundspeed” or “Pike County Breakdown,” other pickers will know there’s a serious banjo player in town. No Tab.